After hearing about big losses and big portfolio drawdowns from friends, I have decided to write a piece on how to avoid all these kind of situations. First of all, let me just say that no trick or strategy will keep you from losses. 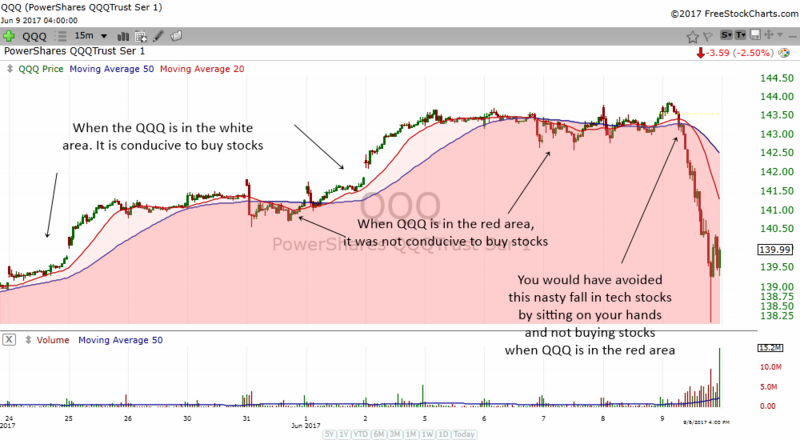 But this simple technique will help you to avoid a nasty situation where your stock goes down the moment you buy it. It will also keep your portfolio intact and help you avoid situations like a 20%, 30% or 50% drawdown in your portfolio. The moment you buy the stock, it goes down immediately and by the end of the day it hits your stop loss? You are making a 30% return in your portfolio, but a sudden drop in the market completely wipes out all the profits and then some? You revenge trade or buy more shares and lose more and more money? You wonder how professional traders keep on making money day in day out? You wonder how the pros seem to be able to get in and out before a big rise or fall happens? If you have experienced all the above, then its time for you to learn this simple technique. 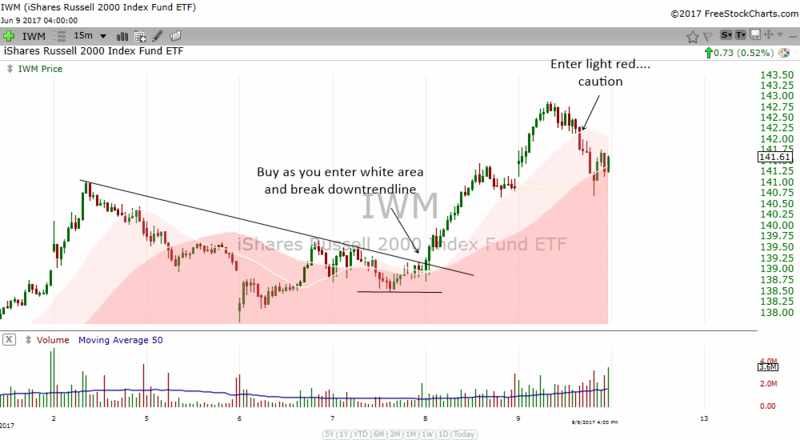 This technique or trick is more for those who trade the markets. Investors may not need to apply this but nevertheless, it will help you to be on the right side of the market at least 75% of the time. The last sections below is beneficial to traders or investors of all time frames. The best time to make money is when the index and your stock is in an uptrend. 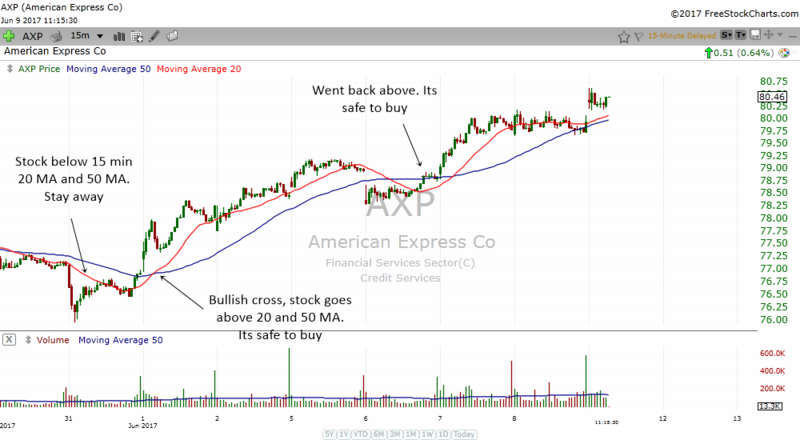 If you take a look at your stock, some of the best gains and sharpest gains comes when your stock is in an uptrend and also when the major indexes is in an uptrend. When the indexes are in a downtrend and sideways trend, that is when most stocks will fall and crash and burn your account. You might also want to strengthen your knowledge by knowing the 4 stages of the market. Read The 4 Stock Market Stages Every Stock Will Go Through. This knowledge is closely related to trends and this current article. When I was younger, I was always fascinated by how magicians can make a colored cloth appear and disappear out of thin air. They will show you two empty hands and then they will clench one hand into a fist and with a wave, they pluck a cloth from the empty hand. I thought it was so cool and I sought out the secret on how to do it. Today, I know the secret and it is so easy to do I was completely stunned at the simplicity of it all. You are always amazed at a magic trick until you learn about the secret. In the stock market, there will always be some people who can pull money out of the market consistently. They also seem to be able to trade in and out of the markets making money when it goes up and selling them just in time before the market collapses. How on earth did they do that? 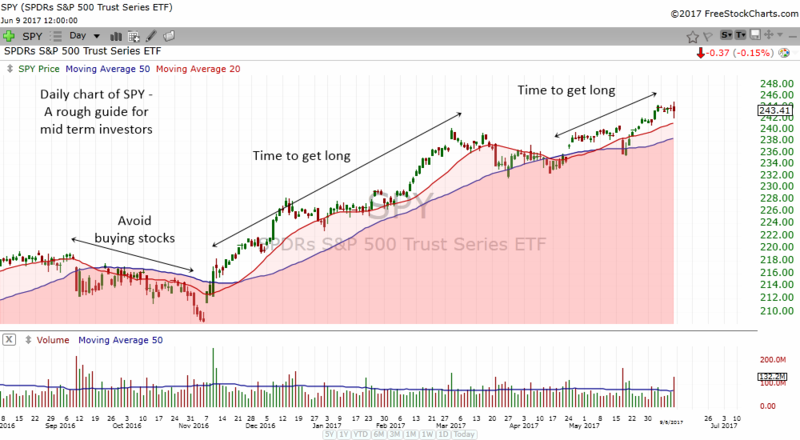 Generally, you will avoid many losses when you buy stocks when the major indexes are above their 20 MA and 50 MA in their respective time frames. That way, you will be trading with the trend, not against it. 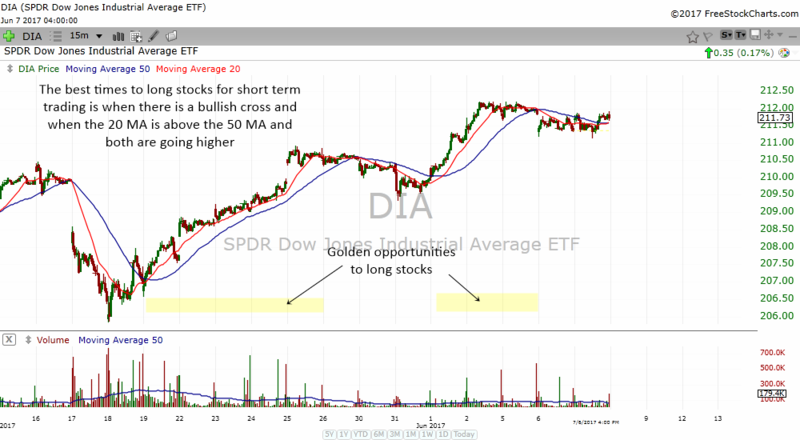 In order for us to determine when we should buy stocks and when we should avoid stocks, I like to use the 15 min chart of the SPY, DIA and QQQ. They are the exchange traded fund of the 3 major stock market indices in US. All these criterias may sound complicated at first, but when you have some practice, they will be quite reliable in telling you when to enter stocks and when it is dangerous to do so. Okay, let's be realistic. 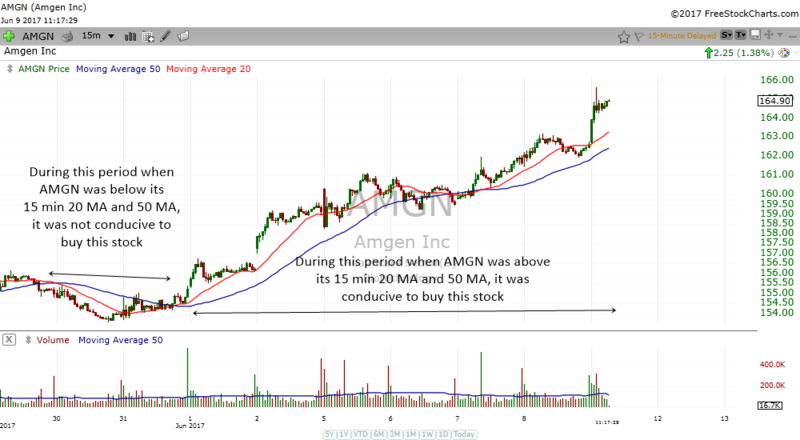 While this technique works well most of the time, there are some stocks that will move higher even if the moving averages are not conducive. On the other hand, some stocks may continue to rise higher even when the indexes are below their 15 min 20 MA and 50 MA. Nothing is perfect. 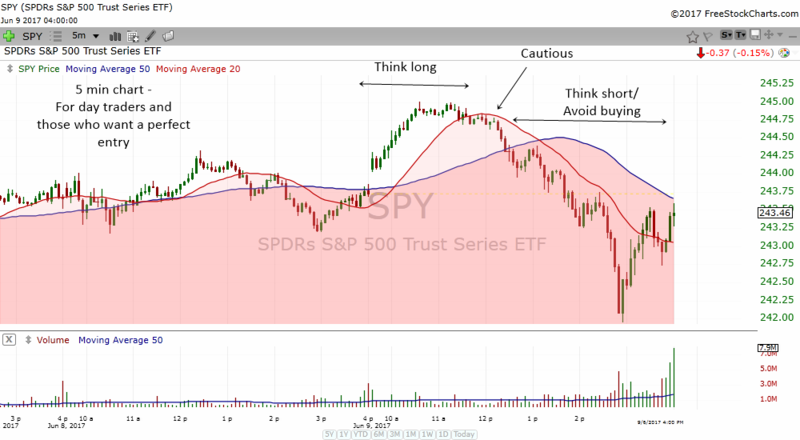 But from experience, I know that you will save yourself a lot of losses when you only buy stocks when the major indexes are above their 15 min 20 MA and 50 MA. 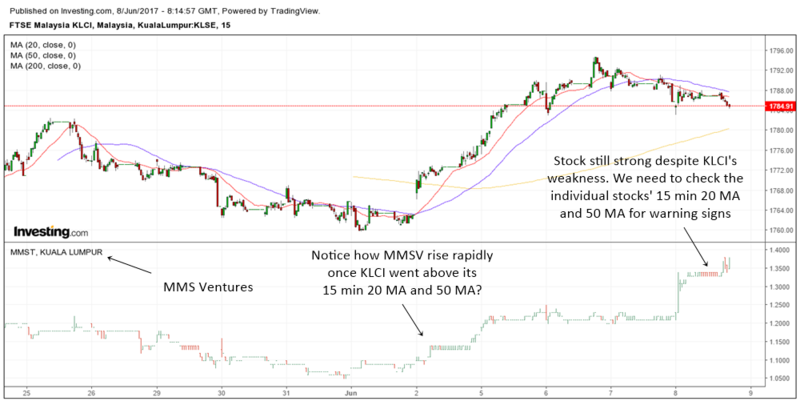 I have noticed that the best time that stocks have massive gains in a short time is when the 15 min moving averages are trending higher with the shorter MA (20) above the longer MA (50). I like to call these periods, the Golden opportunities to long stocks. That's because most stocks will chalk up impressive 2-3 day gains of 5%-10% and even 20%. In the chart above, I have put the QQQ below the chart of Amazon. Amazon is a component of the Nasdaq 100 which is why it makes sense to look at the QQQ and compare it to Amazon's chart. You can see when the QQQ is above its 15 min 20 MA and 50 MA, that was the time that Amazon had the best gains. 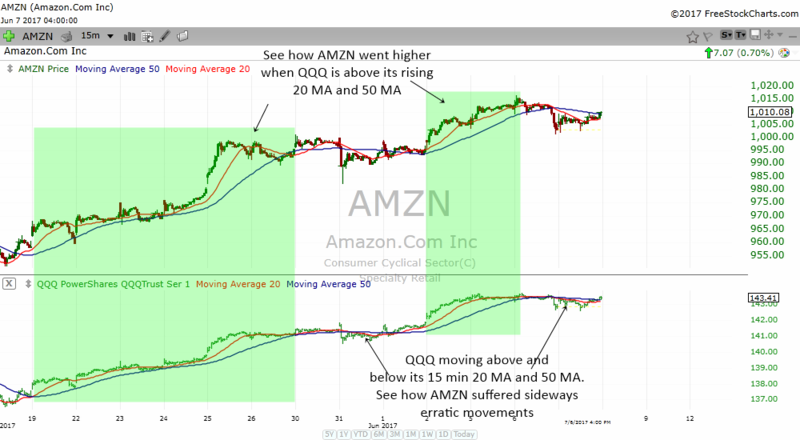 When the QQQ moves sideways and went above and below its moving averages, Amazon suffered some erratic sideways movement which was not conducive to short term traders. Let's take another example. This time AmerisourceBergen Corp which is a component of the S&P 500 index. I have overlayed the SPY underneath the stock chart of ABC. 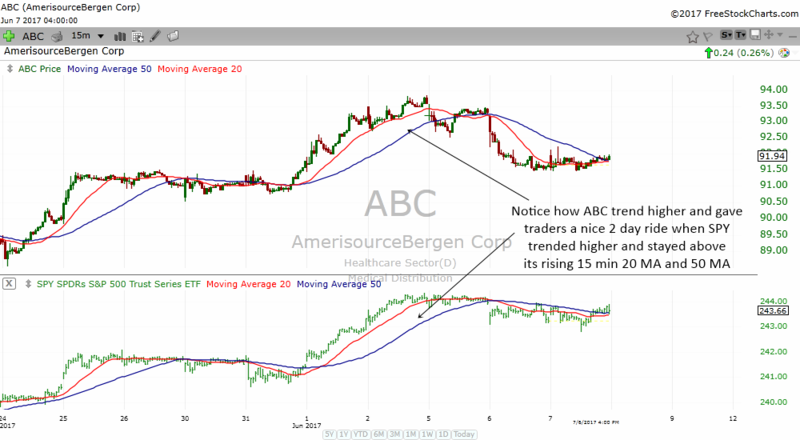 Notice how ABC had some of the nicest 2 day gains when the SPY is above its rising 15 min 20 MA and 50 MA. Notice also how ABC started to decline when the SPY went below its 15 min 20 MA and 50 MA. Time to get out for short term traders. A good technical system should be able to work in almost all markets. Be it a foreign country or other type of instruments like commodities. I found that the 15 min 20 MA and 50 MA also works very well in the Malaysian index. No doubt, they will also work in most world markets. The chart above shows how effective the system is in determining when to buy and when not to buy stocks in Malaysia. 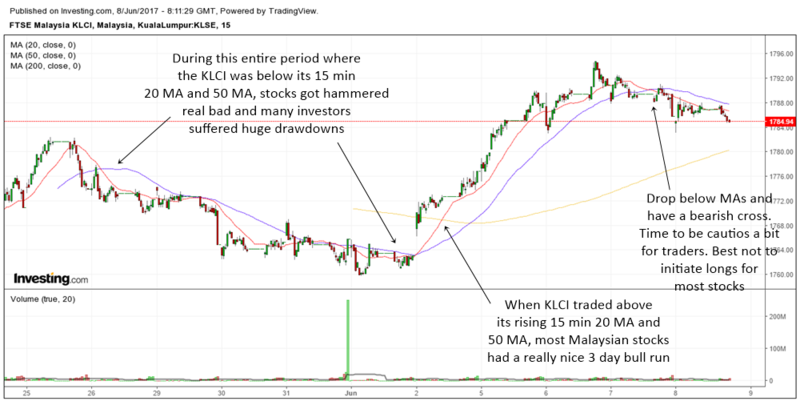 When the index was below the 15 min 20 MA and 50 MA, many stocks in Malaysia were falling and it hurt investors' portfolio. When the index moved above its 15 min 20 MA and 50 MA, many stocks rose with it. MMS Ventures, a Malaysian stock is one of the beneficiary of the rising KLCI. The stock jumped up as the index went above its 15 min 20 MA and 50 MA. Even when the index went below its moving averages, the stock continued to move higher. 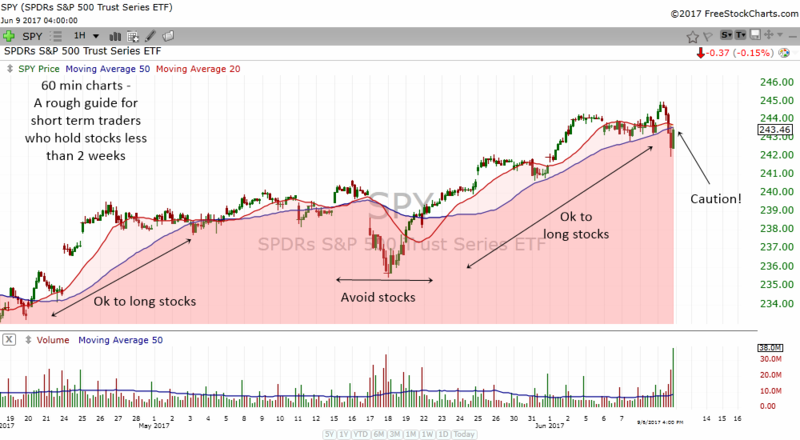 This is where we need to look at each individual stock and see whether they are above or below their moving averages. 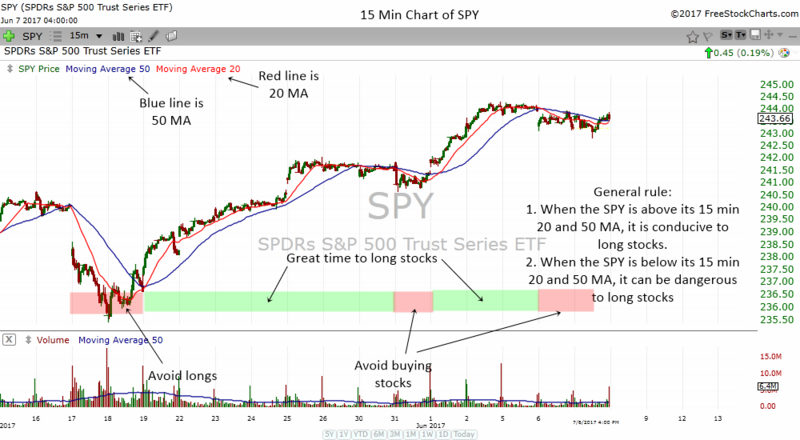 While the 15 min 20 MA and 50 MA system may not be perfect, it is quite an effective trend following system that can help you avoid losses. 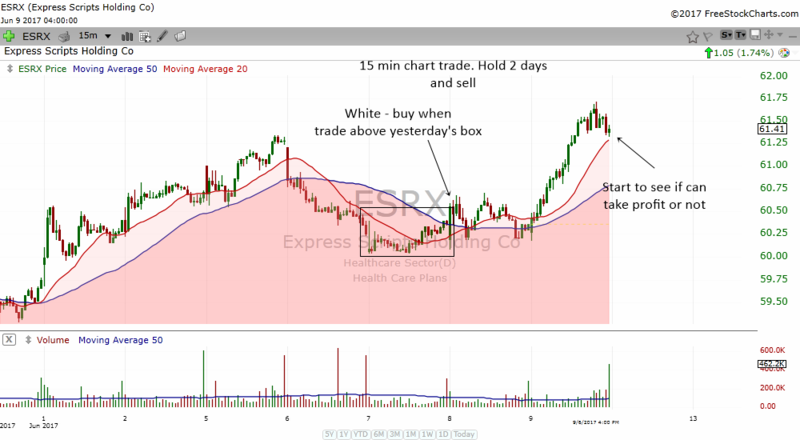 Study the charts below and you will realize they are quite good to help you enter and exit at the best possible price. They will not capture the exact top or bottom but I find that they work quite well to help you catch 75% of the move. There may be whipsaws but experience and your trading setup will help to reduce the impact of whipsaws. While the 15 min 20 MA and 50 MA may be useful, they can often be very hard to see. Especially when you have lots of stocks to go through and you have a long day. So, to make things easier to see, what I do is I shade the area below the 20 MA light red and the area below the 50 MA a heavier red. That way, when the price of the stock is in the red area, it gives me a warning signal. Something like a traffic light. When it is red, you should not buy the stock. Stop and consider things! 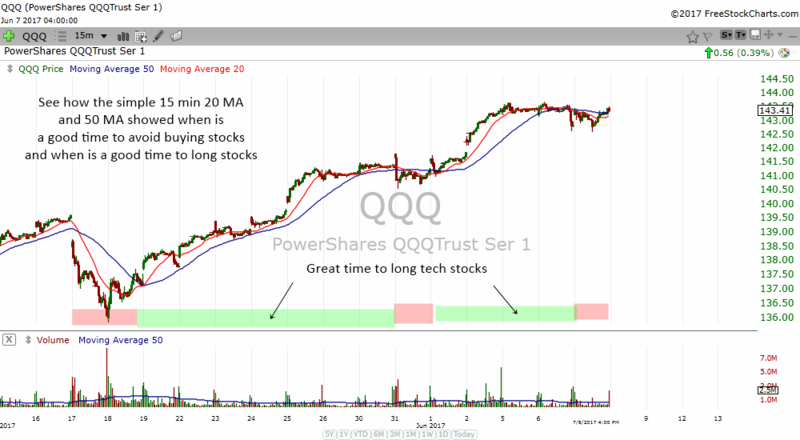 If you are a follower of tech stocks, you want to constantly check the QQQs. 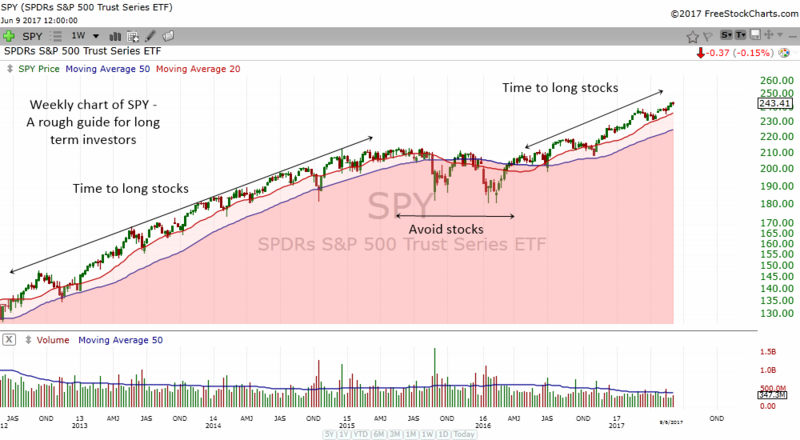 The chart above showed us when and where it was conducive to buy tech stocks and when to avoid them. While the system is not perfect, it was quite good to help us catch some nice 2-3 days trend and avoid a big fall in tech stocks. A color shaded area helps us to spot strength and weaknesses and uptrends and downtrends in individual stocks. Take a look at the 15 min chart of ADBE above. 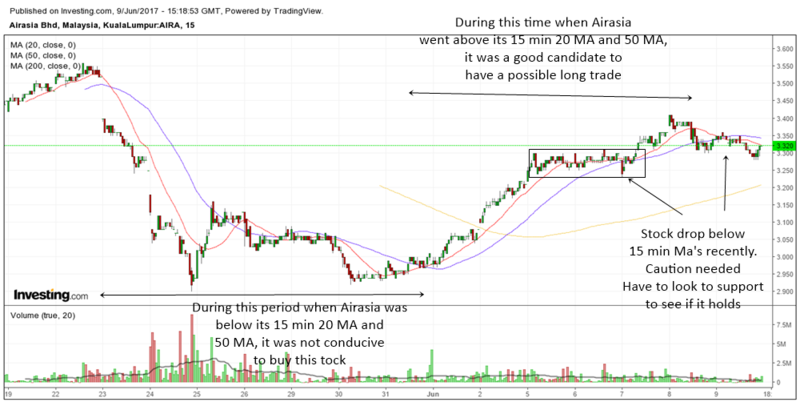 See how it told us when to be long, when to lighten, when to be cautious and when to avoid or short the stock? There are some stock market software makers who will take the beginner who is unaware by selling to them a system that cost $10k. They may even offer it to you at a monthly subscription fee. 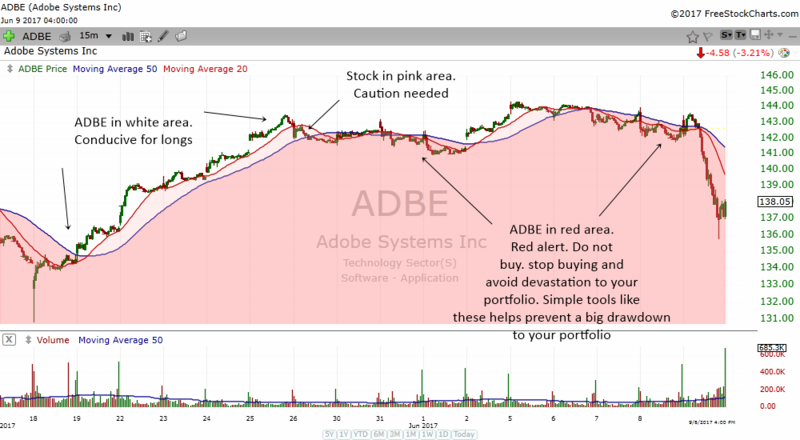 The chart above is the same color shaded chart of ADBE I showed you earlier but I just hide the moving average. Then I input a green arrow for bullish MA crosses for buy signal and a red arrow for bearish MA crosses for a sell signal. Well, you just learned a very effective stock market system for next to nothing! For fun, let us call it the Dstockmarket Proprietary System or DPS for short (not Dr Pepper LOL). 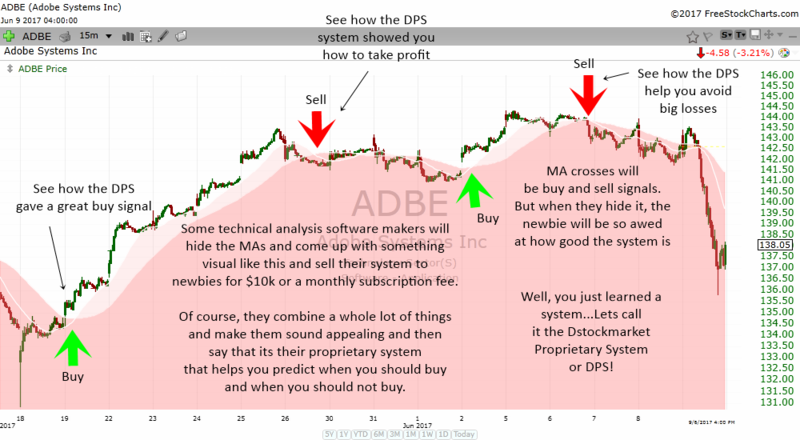 Look how effective the DPS System was able to catch the tops and bottom and the short term trend of ADBE. Having made so many friends across the trading and investing world, I have come to learn that different people have their own preferred time frame to trade or invest. I prefer the 60 min time frame and the 15 min time frame. But some one else who have a full time job as an executive may prefer the daily chart and weekly chart. Some people prefer to day trade and so they like the 5 min chart. The beauty of a good system is that you can use it in all time frames. No matter what time frame you trade in, it is always good to know what the indexes and your stock is doing in different time frames. We call this advance analysis Multiple Time Frame Analysis. Always remember that different time frames will require you to hold stocks for different length of time. 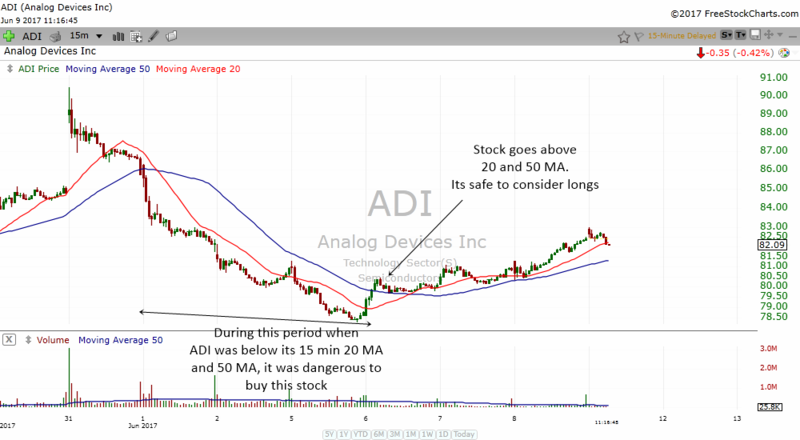 A stock that is in a daily downtrend may be bad for long term holders. But they can often give traders a 15 min uptrend which they can buy and hold for 2-3 days. 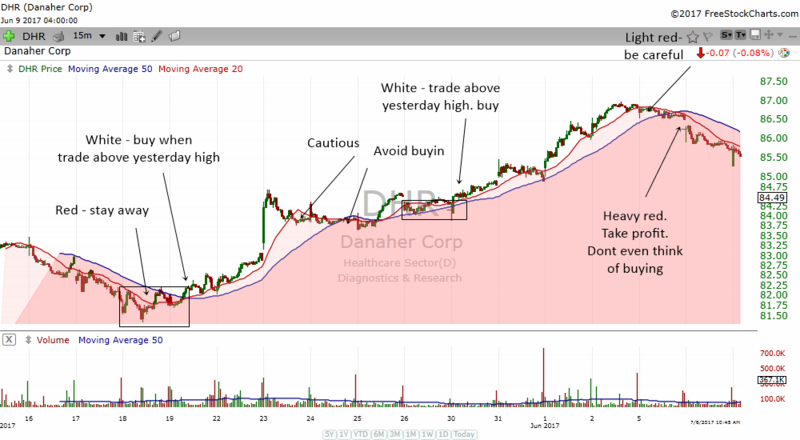 The above charts will show you how effective the DPS system can help you to know when to enter and exit stocks. No trend following system is perfect. A good one will help you be on the correct side of the market 75% of the time. A good system will also help you to catch 75% of the move. We do not need perfection and it is futile to try and find the holy grail. There is no system that guarantees you a 100% success rate. In fact all you need is a system that is successful 50% of the time. This sounds very very strange and impossible for the beginner. Beginners expect a 90% success rate and when trades don't go their way, they get angry with the system, themselves and the person who taught them how to trade when the mistake is with themselves and not others. Newbies are always skeptical, but if you talk to experienced traders, they will tell you that it is possible to make money using a trading setup that has a success rate of only 50%. The key is risk reward, but that will be a topic for another day. Take a look at some of the charts below. If you combine a trading setup or trading strategy with the DPS system, then your odds of success increases. The disciplined trader will come up with a system and rules that they will follow without question. Discipline is the key to trading success. There may be ups and down but if a trader follows his or her trading rules without waver, he or she will be successful in the long run. The system that I show you above is something that I like and I have tailored it to fit me. It may or may not fit you. But I hope it provides you with a starting point to develop your own trading or investing rules.